Christmas is the one holiday that hogs all of the animated and stop motion specials. With Easter, we're lucky to get the Peanuts special. Sure, network television gives us "It's the Easter Beagle, Charlie Brown!" every year, but how many times can we watch ol' Chuck get screwed once again? 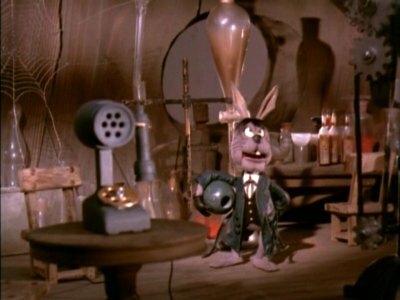 I really wish TV would bring back the 1971 Rankin-Bass stop motion classic, "Here Comes Peter Cottontail." This was made by the same guys that brought us "Rudolph the Red Nosed Reindeer", "A Year Without a Santa Claus" and many other Christmas specials. But Peter Cottontail only aired a couple of times, it seems, in the 70s before disappearing. Thank goodness for DVDs! The special is narrated by Danny Kaye and basically tells the story of how the Easter Bunny became THE Easter Bunny in its trademark charming herky jerky fashion. Peter, however, has competition in the form of an evil bunny named Irontail (who was voiced by Vincent Price) who does everything he can to sabotage Peter's chances of winning a contest that will make him the Chief Easter Bunny. My favorite character in this one was Antoine, a French caterpillar also voiced by Kaye. I couldn't locate any images of Antoine in Google, but what I remember most is his transformation by the end of the special into a colorful butterfly...and that he had a 'stache. Antoine is the operator of a time machine called the Yestmorrowmobile (I know at least a few of us would love a ride in one of those!) Like all RB productions, this one also included a few cute and catchy songs. They don't make animation like they used to. I know today it's all about computers, but there's really a certain charm in Rankin-Bass' creations. You have to appreciate the amount of time and patience it took to make the characters and sets and then actually film them, all for the main purpose of entertaining us kids during the 60s and 70s! 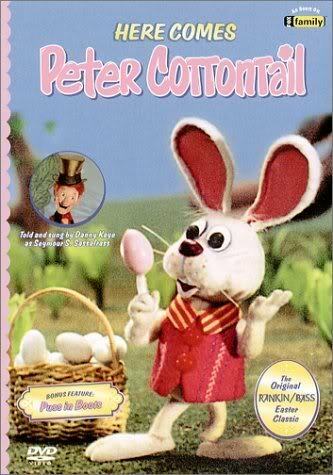 Does anyone else remember Peter Cottontail, or knows if it's being shown on cable in the States? If so, I'd love to know. And...here's wishing my readers a Happy and Healthy Easter! Yay for the Danny Kaye shout out!! I think fewer and fewer people recognize Easter as a "holiday" television wise. I don't get it. I think you can buy that DVD though, so it won't disappear from your life! I loved Danny Kaye... great round up of stories and images. Don't know if they played it this year,but ABC Family usually shows all of the Rankin-Bass shows. I was so mad today! My satellite said that Peter Cottontail w/Danny Kaye would be on today, and it was some new, anime version, not the original! Blast!! Barbara - no way, nothing is immune from getting a do-over anymore! Danny Kaye was dandy. I miss that tv-ready flick, too. Thx for the hoppy flashback! I was just thinking about this holiday special last week and also wishing that they'd put it on TV.